To download kam files for the MeraGana Karaoke Studio Microphone you have to sign up as a subscriber. The subscription is for a period of 12 months or for the download of 150 Karaoke or Singalong songs from the Library, whichever is earlier. You have to download the 150 songs within 12 Months. 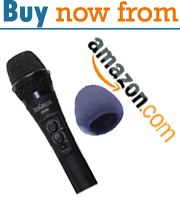 Subscribe to download 150 songs within 12 Months for MeraGana Karaoke Studio Microphone. US$ 11.95 for a subscription of 12 months or for the download of 150 songs, whichever is earlier.